The Spanish Inquisition was a tribunal started in 1478 in Spain. It was started by Ferdinand II of Aragon and Isabella I of Castile. 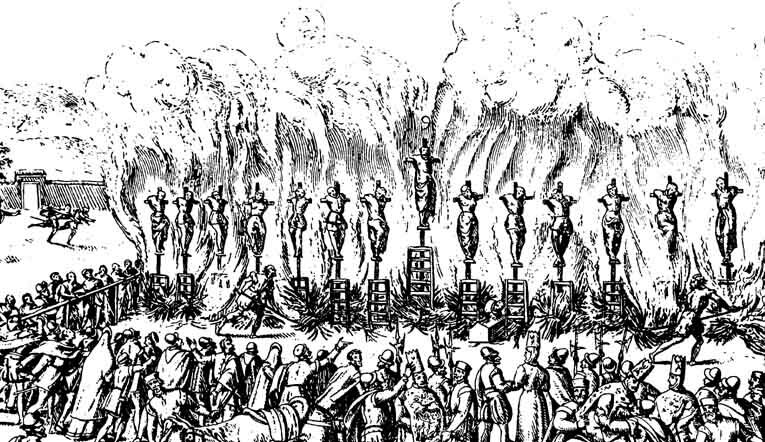 During the Spanish Inquisition many people were burnt in front of crowds in the streets. Anyone who was not loyal to the Roman Catholic church was in danger of being called a heretic and being put to death by being burnt at the stake. Not only Protestants were put to death, but it was also an excuse to get rid of many Jews. A ceremony at which heretics were burnt was called an auto-da-fé. The judge was called the Inquisitor. The rulers of Spain, Ferdinand and Isabella, called for the Inquisition not to exterminate all non-believers of the Roman Catholic Church, but to discourage strong outward belief of other religions. Most trials ended with the defendant simply giving up his beliefs and being let go. The Inquisition was not completely abolished until 1834. Spanish Inquisition Facts for Kids. Kiddle Encyclopedia.